I will admit that I am not the biggest fan of Italian restaurants. While the food is almost always delicious, tradition seems to be a point of intense pride and I tend prefer a little more creativity to my meals. Normally the idea of spending a date night at an Italian restaurant would do anything but excite me but hearing buzz around this week’s restaurant, I was willing to have an open mind. 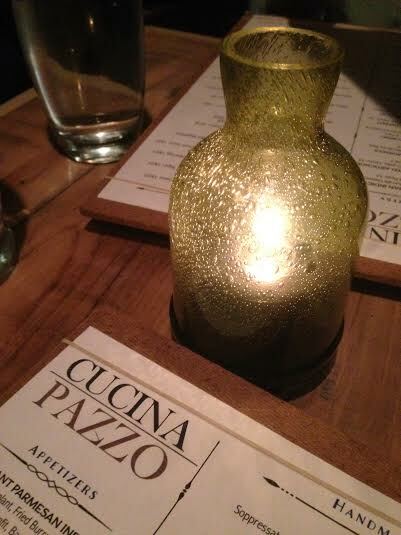 Cucina Pazzo is a cozy little romantic restaurant located in the Central West End serving Italian food with a modern twist. While the menu is based on typical traditional dishes, this menu is anything but ordinary. For example, the Maine lobster risotto is served with a fried egg while the fettuccini alfredo comes with spicy Italian sausage. Our meal started with drinks and I chose the Frutta martini made with vanilla vodka, peach liqueur, peach puree, cream, and cinnamon. This sweet drink tasted just like a dreamsicle and went down easy. We were also presented with rosemary focaccia served in a hot cast iron skillet served with a sweet and tangy dipping sauce. For an appetizer we went with the Sicilian style artichoke stuffed with Parmesan, seasoned bread crumbs, and lemon (crab can be added for an additional charge). Although there was not a lot of meat on the artichoke leaves, the real treat was the artichoke heart at the bottom of the dish. The seasonings were great and the dish was perfect for sharing. I felt like I needed to try one of the fresh fish options on the menu for my main course so I chose the pistachio crusted barramundi served with garlic broccolini, butter poached potatoes, and a spicy lobster sauce. The light, flaky fish was fresh and the broccolini was nicely cooked but the star of the dish was definitely the lobster sauce. I could put the sauce on almost anything or even eat it with a spoon and I would be happy. My husband chose the chopstick pig pasta served with pancetta, Kalua pork, pork belly, bacon, Brussel sprouts, wok vegetables, and a butter sauce. This hearty pasta dish was served with an amazing Asian inspired sauce which was quite a nice surprise given that we were at an Italian restaurant. Although all of the food was delicious, the highlight of the meal was dessert. We chose the freshly baked cookie which came out in a hot cast iron skillet since it was highly recommended by our waiter. This warm, half-baked cookie was topped with ice cream and almond whipped cream mousse and was a great way to finish the night. If you are looking for a unique dining experience be sure to ask for a seat at the bar of the open kitchen so you can enjoy a little show while you eat, reservations not required. I can’t wait for the weather to warm up so I can come back to enjoy a meal on the nice sidewalk patio out front.